erbB-2 Antibody is affinity chromatography purified via peptide column. erbB-2 antibody was raised against a 19 amino acid synthetic peptide near the carboxy terminus of human erbB-2. erbB-2 Antibody is supplied in PBS containing 0.02% sodium azide. erbB-2 antibody can be stored at 4 degree C for three months and -20 degree C, stable for up to one year. As with all antibodies care should be taken to avoid repeated freeze thaw cycles. Antibodies should not be exposed to prolonged high temperatures. Small volumes of anti-ERBB2 antibody vial(s) may occasionally become entrapped in the seal of the product vial during shipment and storage. If necessary, briefly centrifuge the vial on a tabletop centrifuge to dislodge any liquid in the container`s cap. Certain products may require to ship with dry ice and additional dry ice fee may apply. erbB-2 Antibody: The ErbB family consists of four closely related tyrosine kinase receptors that act as potent mediators of normal cell growth and development. 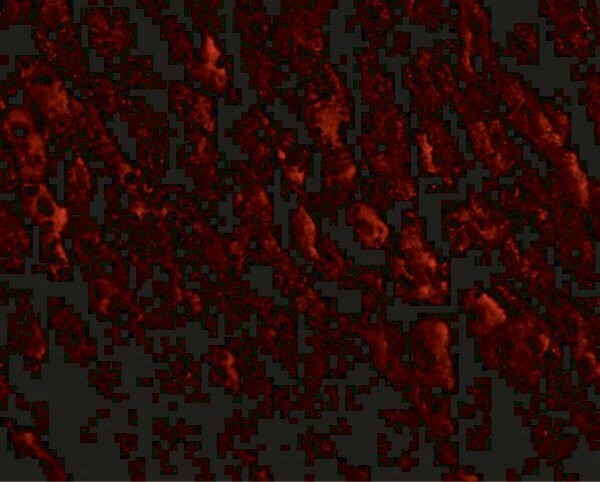 Aberrant expression or function of one or more of these receptors can play a major role in the development and evolution of cancer. ErbB-2, also known as HER2, has been implicated in the evolution of both breast and gastric cancers, and is evident in other cancer types such as ovarian and salivary gland tumors. ErbB-2 possesses an active tyrosine kinase domain, but no direct ligand has been identified yet. ErbB-2 is the preferred binding partner to the other members of the ErbB family and is thought to act primarily through the Ras-MAPK, PI3k-PKB/Akt, and PLC-PKC signaling pathways. Numerous anti-cancer strategies have been employed against erbB-2, such as antibody-based therapies to prevent ligand binding or receptor activation through dimerization, antibody-dependent cell mediated cytotoxicity, in addition to direct kinase inhibition to prevent molecular activation/downstream signaling. 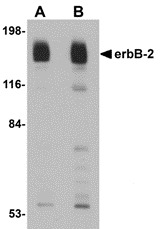 erbB-2 antibody can be used for detection of erbB-2 by Western blot at 1 - 2 mug/mL. Antibody can also be used for immunohistochemistry starting at 2.5 mug/mL. For immunofluorescence start at 20 mug/mL. Western blot analysis of erbB-2 in rat liver tissue lysate with erbB-2 antibody at (A) 1 and (B) 2 μg/mL. 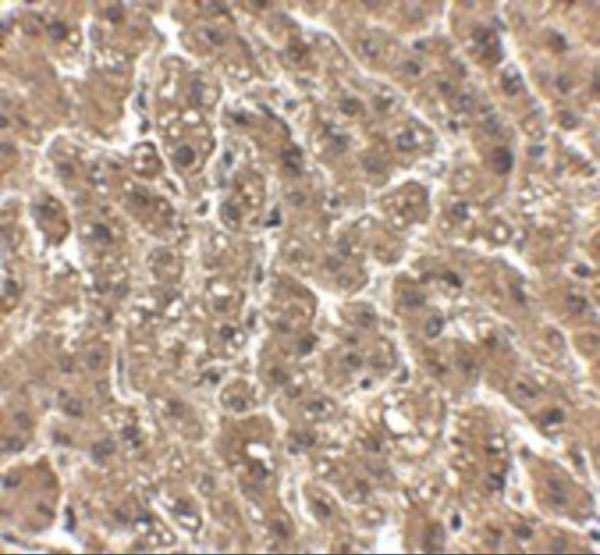 Immunohistochemistry of erbB-2 in human liver tissue with erbB-2 antibody at 2.5 μg/mL. Immunofluorescence of ERBB2 in human liver tissue with ERBB2 antibody at 20 μg/mL. HER2: a proto-oncogenic receptor tyrosine kinase of the EGFR family. Essential component of a neuregulin-receptor complex, although neuregulins do not interact with it alone. Not activated by EGF, TGF- alpha and amphiregulin. Amplified in breast cancer. Overexpression induces constitutive activity, and the gene is amplified or overexpressed in up to 30% of breast cancers, correlating with poor survival. The antibody Herceptin is approved for treatment of metastatic breast cancer with HER2 amplification/overexpression. Somatic mutations seen in 4% of lung cancers and also in breast, gastric, ovarian cancer and glioblastoma. One SNP shows predisposition to breast and gastric cancer. Inhibitors: Herceptin, lapatinib, PKI-166, EKB-569, CI-1033. 1. HER2 positivity significantly correlated with higher stages and lymph node metastasis in colorectal carcinoma.